Oriana Thorpe is an Inn keeper on the Cornwall coast. Her family have been wreckers and smugglers, but she is determined to help people instead. Her brother is a murderer and a pirate. He is likely to come after her because she betrayed him. Captain Pierce Walsingham is a "revenue man" who living under an assumed name until he can catch the man who sunk his ship, killing many of his men. There is one place he should be able to find him if he can tempt him to go there. Our heroine is trying her best to look after the nearby widows and orphans with the help of a Lady whose life she saved. She is always looking over her shoulder knowing her brother will kill her eventually. Our hero has many reasons to be distrustful of the known smugglers on the coast. An intriguing and swashbuckling story. You will fall in love with the characters, especially the heroine. Lots of fun and a lovely romance. It is part of a series but easily read as a stand alone. I loved it. Oriana Thorpe’s life would be so much easier without the constant threat of her brother Charles’ retribution hanging over her head. Mad, murderous Charles – also known as Captain Carnage – had vanished, but when Oriana receives a note from him, she knows what little peace she’s known is about to come to an end, and most likely her own life as well. Former pirate hunter and present Black Regent Captain Pierce Walsingham promised his sister Chloe to protect Oriana, the latter having saved Chloe’s life. It’s under the guise of unassuming fisherman John Hunt that Pierce intends to keep Oriana safe. While Pierce expects trouble from Charles – and hopes to vanquish him once and for all – what the Black Regent had not anticipated was his attraction to the lovely Oriana. I love Katherine Bone, I love the Regent’s Revenge series, but Ms. Bone rises to new heights with THE PIRATE’S DUTY with her exquisite writing. The author is known for her cinematic descriptions, superb action sequences, wonderfully dashing heroes and fierce heroines, but in this book it is her spectacular prose that dazzles and enchants! The writing is positively astonishing: literate without sounding pompous, each gloriously impeccable sentence drives the story forward seamlessly. From the first paragraphs, Ms. Bone sweeps her reader in another time and place through carefully crafted characters, and breathtaking descriptions illustrated with pertinent period details that made the Cornish coastal scenery and Oriana’s inn real for me. The suspense builds slowly, as we experience life in the village, while a feeling of impending doom always looms in the background as Oriana and Pierce gradually fall in love. I find it fascinating that given the premise of the series – each book features a new Black Regent and a romance – that the tone and content are startlingly dissimilar, while retaining the same spirit of adventure, excitement, and romance. 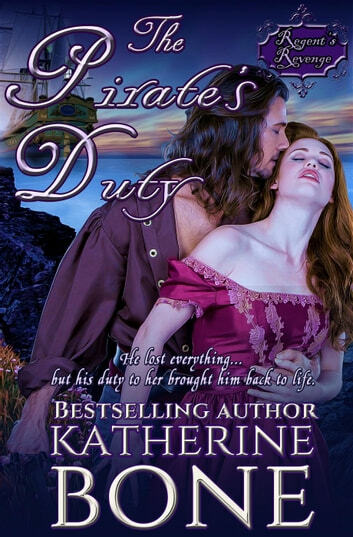 THE PIRATE’S DUTY is a charming romance, the story is solid and compelling, and the ending is fabulous! I must add a few notes regarding details that might not matter to all readers: I was overjoyed that no one dwelled over one’s particularly enticing smell or various body parts, and as a bonus, there is not one single typo to be found! I voluntarily reviewed and advanced reader copy of this book.